In the dining area next to the kitchen, a wash basin from 1617 locked in the wall, hints at the possible age of our house. Its obsolescence with indoor plumbing has relegated it to being the telephones residence with tattered address books, note pads and pencils for company. That the house was once a monastery, the adage of cleanliness being next to godliness was quite well echoed by the cherubic faucets. But as a child I spent hours looking at this niche, fascinated and disturbed by it. At 12 years of age I wondered how it worked without plumbing. When I returned after 26 years, I could imagine a bucket filling the basin above anticipating the brothers return from the fields for their meal. Side by side they would stand, washing themselves. I had to take this photograph so that I could continue to study it and try to understand why it still captivates me. But to this day, I haven’t found an answer to this fascination. And I was a nun, lol. What a contemplative place to bath. I can imagine what a connection to God they felt as if they washed away more than dirt. It does have the actual and metaphorical cleansing thing going for it, doesn’t it? Interesting thought Russelle… I’m glad that you think so! Fascinating photography and interesting comments. 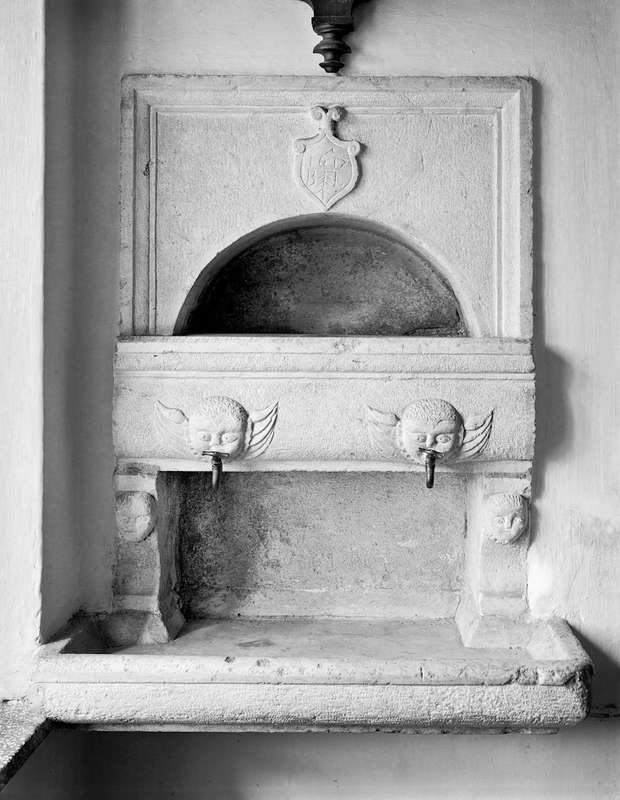 I love the mystery surrounding this wash basin. I can hear the monks grumbling. Grrr water’s cold again!!!!! LOL!! Me too… actually I remember saying the same thing Chris, on colder mornings there! !